Begin a 42 Rules Book Club/ Learning Circle Today! This template offers a worksheet to begin the analysis of organizational rules and policies impact on customer and employee engagement. This template provides worksheet to identify both the skills you wish to improve and the team members you will enlist to coach you and provide feedback along the way. It has you develop a strategy for getting under new management successfully. This worksheet provides process for analysis of silver bullets at play on three different levels within the organization. 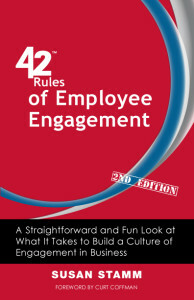 It has you examine the impact on both the customer and employees. This template offers analysis and tracking of communication mode for three members of your team. It challenges you to get input on your team’s perception of how genuine the communication really is and challenges you to respond to this input. This worksheet has you gather input from you team on the areas they’d most like to see you improve. Based on these conversations, you can rank order their input in priority order and develop target dates as you begin to work on each new skill you tackle. This template unlocks the door to 25 weeks of learning activities that address both personal productivity and team development. This worksheet allows you to create a tailored plan for each member of your team to meet their unique needs in those rare times they may need a little extra support from the team. This template provides a process for you and your team to explore the three solutions to all human relations problems and analyze past success and results with each. This worksheet helps you reflect on the relationship between your behavior and your team’s behavior regarding the sharing of information. It has you assess your current level of sharing for its impact. Has worksheet has you explore the beliefs you hold about each member of your team. As you formulate this list of beliefs, you examine each for potential impact. This template has you analyze the last three decisions you worked through with your team to determine the level of authority you typically maintain in this process. This process helps you to assess your leadership style and determine if it is in balance. This template provides links to audio “tours” of two books written about the DISC model and provides a worksheet to process and plan to use what is learned with your team. This worksheet provides a strategy planner for those team members you identify who operate from the “D” style of behavior. The worksheet includes a list of suggested relationship tips for interacting more effectively with people who operate from this style of behavior. This worksheet provides a strategy planner for those team members you identify who operate from the “I” style of behavior. The worksheet includes a list of suggested relationship tips for interacting more effectively with people who operate from this style of behavior. This worksheet provides a strategy planner for those team members you identify who operate from the “S” style of behavior. The worksheet includes a list of suggested relationship tips for interacting more effectively with people who operate from this style of behavior. This template provides a suggested model for having a performance discussion to role play with a peer before taking the discussion to the employee. You can refine your approach with the feedback of a colleague and be truly prepared for a successful outcome. This template provides a planning process for managers who have a difficult time delegating or offering assignments to team members for fear the project to task will not meet their standards. This template provides a place to gather information during critical conversations with each team member about their “stretch goal” (both personal and professional). It also offers a process for helping the team reframe challenges and difficulties the team has faced so it can stay focused on goals. This worksheet provides a way of analyzing your need to have all the answers or to help your team find the answers. This template provides a simplistic but powerful process to develop a team approach and reduce internal competition on your team. This template offers a process for analyzing the real impact of a fear’s paralyzing effects and and then comparing this cost to impact of facing a fear and failing. This template offers a powerful way to audit your teams time investment in the various tasks, projects and activities it is tied to. The team will have a big picture to do some analysis and decide on adjustments. This worksheet helps you assess if you are a good parent manager. This worksheet provides a process for having team members assess you on a list of bad parenting attributes and gather input on requested improvements the team desires. This worksheet provides a process for charting your team member’s current “capacity” as you see them… and then envision them at a capacity ten times this current view of them. This template provides a simple tracking tool for brief encounters with your team to ensure you utilize coaching moments for both recognition and for corrective coaching. This template provides a way for you to analyze the ratio of positive to negative feedback you provide to each member of your team and assess the impact of your approach. This template leads you through the six step process outlined in the book and has you reflect afterward on the results as compared to “off the cuff” problem solving approaches. This worksheet walks you through questions associated with each step of the change model in the book. This worksheet provides a place to collect the desires of each team member concerning how they want to be treated on the team and if they feel these needs are generally met by the team. This template provides a simple but powerful activity to point out the similarities the team has with each other. It enables team members to get to know each other on a more personal basis. This worksheet walks the team through an audit of the organizations, the teams, and the individual promises that are made to the customer and each other to be sure they are appropriate and realistic. This template offers an audit of the team’s talents and an assessment of the benefit the team (and customer) reap from these skills and gifts. This worksheet provides a simple clear way to get alignment on your team. This worksheet is an awareness tool to begin to see the amazing number of coachable moments at your disposal. It is also an assessment of your coaching style. This final template simply suggest you ask your team what they need to be more fully engaged in the work of the organization. You’d be amazed the results such a question can produce.